Jazz musicians are notoriously restless and they aren’t content with chords containing only three and four notes on the ukulele; they love to add colour and variety and use extended chords with five notes or even more. Now, if you’re really on the ball, you may have noticed a problem here: how do you play a five-note chord on a four-string ukulele? Just like you add a seventh note to create a 7 chord you can add other notes to chords. The most common are 6 and 9. The variations are so numerous that memorising them is difficult. But if you want to get deep into jazz playing, learning the theory behind these chords is worthwhile; it enables you to come up with your own chord shapes when you encounter the names of complex jazz chords (check out Music Theory For Dummies by Michael Pilhofer and Holly Day for more in-depth information). Sixth chords work in a similar way to seventh chords. In a seventh chord you drop the root note down two frets. For a sixth chord you drop it one fret further. 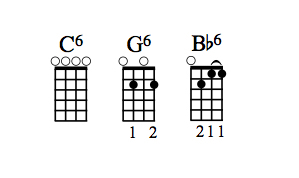 Here are the most common sixth chords: C6 (which is just all the strings open), G6 (the same shape as an Em7 chord) and Bb6 (the same shape as a Gm7 chord). C6, G6 and Bb6 chord diagrams. Rather than changing a seventh chord like the sixth chord, a ninth chord adds an extra note on top of it. This is known as an extended chord. 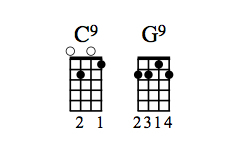 Here are two of the most common ninth chords on the ukulele: C9 and G9. C9 and G9 chord diagrams. Sometimes you see chords listed 9 and sometimes as add9 e.g. C9 and Cadd9. To be a true 9 chord, the chord must also have the 7 note in it. An add9 chord is just a major chord with a 9 note added. Since we only have four strings on a ukulele and we’ll have to drop a note anyway, you can treat an add9 chord as a substitute for a 9 chord. Look below for the equivalent add9 chords for the chords. 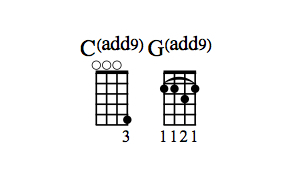 Cadd9 and Gadd9 chord diagrams.